What do you do when sleet and freezing rain occurs and preschool closes for a week time? You can make a Homemade Fishing game! In the second week of January we got sleet rain and CJ preschool was closed for a week. During the Vacation, We created a DIY Fishing game:-) CJ has a fascination for fishing, She really enjoyed creating the game. 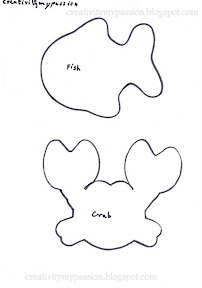 Day 1: I was thinking of making Fish and Crab outlines but CJ wanted to add other Sea creatures. 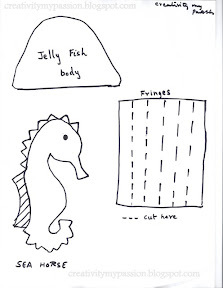 So we ended up creating sea horse, star fish, jelly fish and octopus. Then let your kid paint the fish with marker, Crayons or poster paint. Same way you can create crab pictures. Stencils and painting : Draw fish outline on the recycled Styrofoam container as shown below. 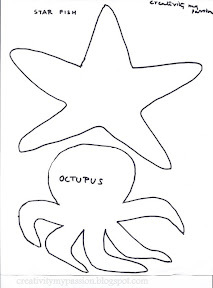 Using a X-acto knife or Craft knife, Cut along the outline to create a stencil as shown below. Now that you have got a bunch of them, cut out the fish and crabs. Download the template from above. Get your kid to make strokes in the horizontal direction. You can ask them to make it wavy to give wave effect. Let your kid to paint from the top of the poster board(I inverted the poster board for easy access). When they complete painting the Water surface, Same way let them paint the sand surface. Freehand some leave designs, coral design on to construction paper or poster board and let your kid cut them out. You can let them color the designs or use colored construction paper. Glue the leaves to sand. Just glue the base of the leaves to sand. This gives a swaying effect for the leaves, coral, seaweed. I had saved a collection of sea shells from our last summer Beach visit. CJ glued the sea shells to the sand. Using Bubble sheet we gave a pebbly effect to one side of the sand. 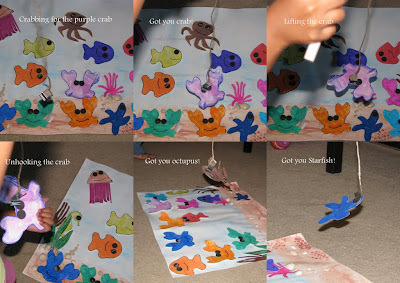 Day 3: CJ loved her underwater scene creation and she had fun fishing for the sea creatures. First I let CJ arrange them in random order. She had fun arranging them! I taught CJ to place the sea creatures in appropriate places like sea horse behind sea weed, starfish on the sand, Crab on the Sand. From the next phase of fishing, She kept them in the same order. Oh wow. The post just gets better and better! I love how you traced the toys and then I love your final picture AND that you went fishing! What a brilliant fun and lovely craft! :) Have a great rest of the week. Wow, you guys did a great job! Very cute!! Snap! I'm just about to write up our version of this go fish game - which has some numbers added in. I really like your idea of making an under the sea background - we didn't think of that. Thanks for sharing with our Play Academy. PS have featured you on "Water Get Crafty"
Would love it if you would share this on my link party serenity saturday.